On this date in 1911,* Dmitry Bogrov was hanged in Kiev for assassinating Russian Prime Minister Pyotr Stolypin. Many could diagnose the long-advancing rot of the Russian state, but few had the physic to abate it. Stolypin, a resolute conservative landowner, might have been tsarism’s last, best hope. During the cataclysmic 1905 revolution, Stolypin was governor of Saratov and kept his province notably free from disturbances. It’s left to the speculation of posterity whether he could have pulled the trick: in the event, Stolypin did not get 20 years and Russia did not get peace. For some, like Solzhenitsyn, Stolypin is the lost chance for a Russia without either despotism or revolution: “He brought light to the world and the world rejected him.” For many others, that Great Man theory is a bit much. Russia’s issues with class and governance were a pretty long-term concern. One of its long-term products was Russia’s energetic radical underground, and this Stolypin harried Russia’s revolutionaries from pillar to post, greatly intensifying police surveillance and infiltration of agitators’ circles to prevent a repeat of 1905. His secret courts meted out punishment with a greater regard for swiftness than certainty; a staggering 3,000 radicals were hanged for alleged involvement in terrorism from 1906 to 1909, generating worldwide condemnation and causing the phrase “Stolypin’s necktie” to enter the lexicon as a synonym for the noose. Of course, there was plenty of real terrorism, no small part of it directed at Stolypin himself. He survived or avoided several assassination attempts, including a bomb that took the life of his daughter. In turn-of-the-century Russia, though, there was always a next man or woman up when it came to the propaganda of the deed. In September 1911, at festivities marking the quinquagenary of the liberation of the serfs, Stolypin attended the Kiev opera’s performance of The Tale of Tsar Saltan. The (obviously non-operatic) cartoon adaptation of The Tale of Tsar Saltan; the source material for both opera and cartoon is a Pushkin poem. 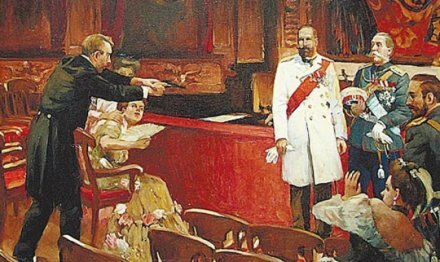 As the third intermission drew to a close, a young bourgeois approached Stolypin, drew a Browning pistol, and shot the Prime Minister. Legend has it that Stolypin opened his bloodied waistcoat and addressed the close-enough-to-witness-it sovereign with the words, “I am happy to die for the tsar.” The prime minister would linger on and die a few days later; his murderer did not long outlive him. Bogrov (English Wikipedia entry | Russian) was a revolutionary, but he was also an informer for the Okhrana, the tsarist secret police whose augmentation had been a key Stolypin priority. Just where Bogrov stood at any given time in the vast foggy marches between compromised true believer and agent provocateur is difficult to pinpoint. The Kiev opera on the night Bogrov shot Stolypin was thick with military personnel, but nobody at all stood watch on the oft-targeted politician — even though there was specific intelligence of a possible threat, issued in his capacity as an informer by the Janus-faced Bogrov himself. The eventual assassin was admitted to the theater that night on a ticket provided by his police handlers. Considering Bogrov’s very swift execution, and the fact that the tsar suspiciously shut down the investigation (Russian link), many believe that elements of the state security apparatus were the true authors of Stolypin’s death, whether or not Bogrov himself realized it. Russia’s great landholders, never noted for farsightedness, widely opposed the reductions of their estates demanded by Stolypin’s agricultural reforms and rightly saw him as about the only man with the clout to move policy against their considerable opposition. They weren’t sorry to see him go. As for Bogrov, his departure was a mere footnote. He asked for a rabbi before his hanging, but when he found out that this presumably confessional meeting would be monitored by the public prosecutor, he withdrew the request. (London Times, September 26, 1911) He reportedly died almost indifferently, his last words a disarmingly casual inquiry to the executioner about how best to position his head within his Stolypin’s necktie. * September 12 by the local Julian calendar; September 25 by the Gregorian calendar. On November 1, 1943, a fourteen-year-old boy named Anatoly Kuznetsov came within seconds of execution in his hometown of Kiev in Nazi-Occupied Ukraine. As he admitted decades later, his crimes were numerous and all were worthy of the death penalty, according to the laws of the Germans. They included such grave sins as stealing beets, breaking curfew and sticking up an anti-Nazi leaflet. By the time I reached the age of fourteen, I had committed so many crimes on this earth that I should have been shot many times over. […] Moreover, I was not a member of the Party or the Komsomol, nor a member of the underground; I was not a Jew or a gypsy; I did not keep pigeons or have a radio set; I did not commit any crimes openly; and I did not get taken as a hostage. I was in fact a most ORDINARY, unexceptional, insignificant little chap in a peaked cap. But if the regulations drawn up by the authorities had been observed scrupulously, according to the principle of ‘If you did it you pay the penalty,’ then I had LOST THE RIGHT TO BE ALIVE twenty times over. I persist stubbornly in remaining alive, while the number of my crimes increases in a catastrophic manner, so that I have stopped counting them. All I know is that I am a terrible criminal who has still not been caught. The closest young Kuznetsov actually came to being killed was on November 1, 1943. His very existence in Kiev had become a capital offense by then: all the civilians were supposed to have followed the German Army as it retreated from the city ahead of the advancing Russians, on pain of instant death. At that moment I heard a noise. I started, raised my head and saw a German soldier carrying a rifle; then I caught sight of another one on the street outside … When I thought they were not looking in my direction I dodged round the corner of the house, again cowering down rather stupidly, not looking round and averting my eyes from them in a sort of superstitious belief that they would not see me. I heard someone shout, “Hey! … Hey!” and I straightened up and stopped. I took a few steps along the wall. “You’ll be shot,” he said sternly, and started to raise his rifle. Right in front of my face — not in the cinema, or in a picture or in a dream — I saw the black hole at the end of the barrel, and had in my nose the unpleasant smell of gunpowder (meanwhile the elder German apparently went on saying something, but the dark one — alas! — wouldn’t listen); ages seemed to pass and there was no shot. Then the end of the barrel dropped from my face to my chest and I realized at once in amazement that that, apparently, was how I was to be killed — shot in the chest! He had only to squeeze his finger. I suppose on November 1st every year I ought to remember and thank that finger, the forefinger on his right hand, which let me live. Five days later, the Red Army arrived and Kiev was liberated. 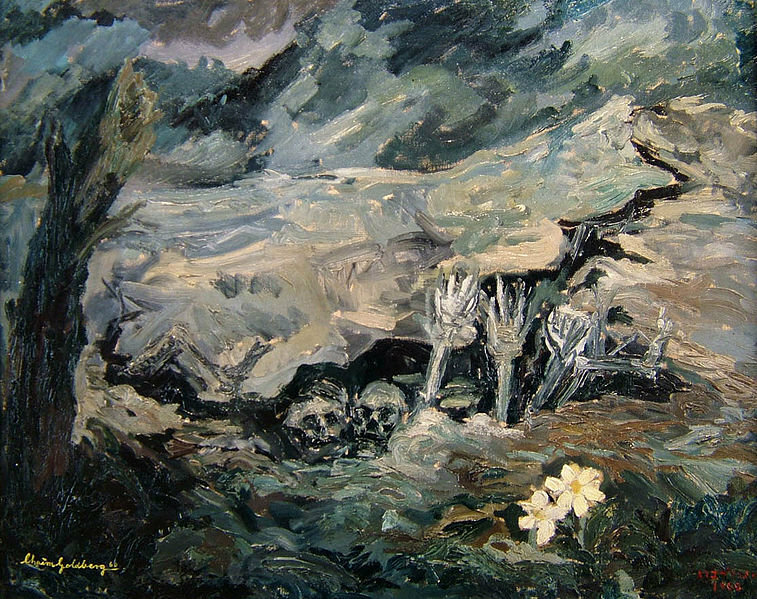 Kuznetsov would grow up to write a memoir and documentary history of his experiences during the occupation, including his aforementioned brush with death. The book, Babi Yar: A Document in the Form of a Novel, is considered a classic in the literature of World War II and the Holocaust. Parts of it have already been quoted on Executed Today. 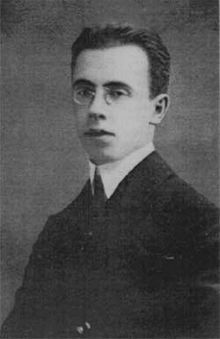 Kutznetsov died in London in 1979. He was forty-nine years old. 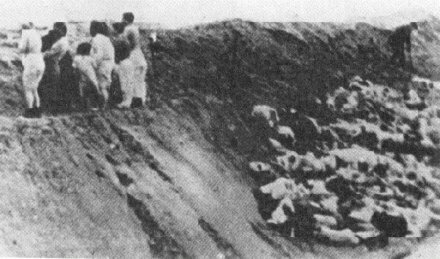 Between September 29 and September 30 in 1941, the Nazis, specifically Einsatzgruppe C, shot some 34,000 Jewish people at Babi Yar, a ravine outside of the Ukrainian city of Kiev. The United States Holocaust Memorial Museum gives a suspiciously specific death count of 33,771. This is considered the single largest mass murder of World War II, and for Kiev it was just the beginning. Kikes of the city of Kiev and vicinity! On Monday, September 29, you are to appear by 08:00 a.m. with your possessions, money, documents, valuables, and warm clothing at Dorogozhitskaya Street, next to the Jewish cemetery. Failure to appear is punishable by death. The Jews believed they were being resettled. They had no knowledge of Nazi atrocities, as the Soviet press had supressed such accounts. By the thousands they arrived at the cemetery with their belongings, expecting to be loaded onto trains. Instead they were forced to strip naked and leave their clothes, shoes and possessions at designated places, all while being beaten by the Nazis and their Ukrainian accomplices. The naked Jews were led into a ravine which measured approximately 150 m long, 30 m wide and 15 m deep. Two or three narrow entrances led to the ravine, through which the Jews were driven. When they arrived at the edge of the ravine they were taken by Schupo officers, and laid down on top of Jews who had already been shot. All this happened very quickly. The corpses were neatly stacked. As soon as a Jew lay there, a Schupo marksman came with an mp and shot him in the neck. The arriving Jews were so shocked when they saw this horrible scene that they were absolutely submissive. It even happened that some lay themselves down and awaited the shot. There were only two marksmen who carried out the shootings. One marksman was at one end of the ravine, the second one at the other end. I saw the marksmen standing on the already piled-up corpses while shooting one person after another. As soon as a Jew was killed by a shot, the marksman climbed over the corpses of the killed to the next supine Jew, and shot them. This went on again and again, without any distinction being made between men, women, and children. The children were led to the ravine with their mothers, and killed with them. Much of what is known about the massacre comes from Dina Pronicheva, a survivor who later testified at the war crimes trials in 1946 and whose story is told in the most graphic terms in Anatoly Kuznetzov‘s memoir/documentary history Babi Yar: a Document in the Form of a Novel. Contrary to popular belief, Pronicheva was not the only survivor — there were at least three or four others — but she is the most famous one and the only one to testify at the war crimes trials. Pronicheva, an actress at the Kiev Puppet Theater, tore up her identity card when she realized what was happening. 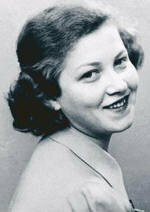 Her last name and her appearance were not typically Jewish, and she told one of the Nazis that she was a Ukrainian who had been seeing someone off and gotten caught up in the crowd. She was told to stand aside with a group of other people in the same situation. The Nazis decided to shoot them anyway, however, as they could not allow witnesses to come back to the city and tell what they knew. It seemed to her she fell for ages — it probably was a very deep drop. When she struck the bottom she felt neither the blow nor any pain, but she was immediately spattered with warm blood, and blood was streaming down her face, just as if she had fallen into a bath of blood. She lay still, her arms stretched out, her eyes closed. All around and beneath her she could hear strange submerged sounds, groaning, choking and sobbing: many of the people were not dead yet. The whole mass of bodies kept moving slightly as they settled down and were pressed tighter by the movements of the living. The Germans went around the ravine firing their revolvers into anyone who appeared to be still alive. One SS man got suspicious of Pronicheva’s appearance. He kicked her hard in the chest and then stomped on her hand until the bones cracked, but she managed to remain limp and silent and he went away without shooting her. Eventually she was able to crawl out of the ravine and make good her escape. Babi Yar continued to absorb bodies throughout the Nazi occupation of Kiev: Jews, Gypsies, Ukrainians, political activists and basically anyone who pissed the Nazis off. 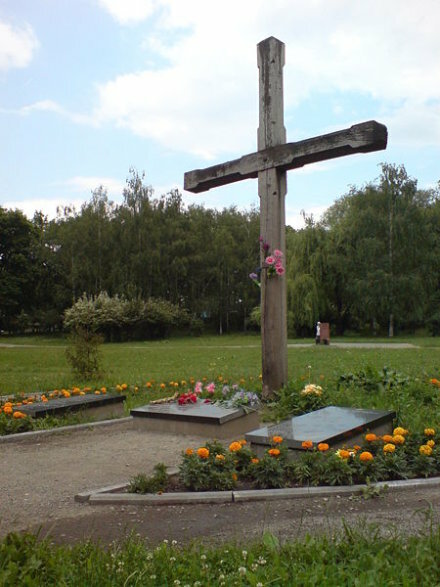 The total number of victims will never be known because before they were driven from the area by the Russians, the Nazis dug up the ravine and burned the corpses. Nearby there had been a fall of sand, following the rains, which had exposed an angular projection of granite and a seam of coal about a foot thick. There were goats grazing on the hillside with three little boys, each about eight years old, looking after them. They were hacking away diligently at the coal with little picks and breaking it up on a granite block. The coal was brown and crumbly, as though it was a mixture of ashes from a railway engine and carpenter’s glue. “See here!” And one of them pulled from his pocket a handful of something that glittered where it was not covered in dirt, and spread it out in his hand. It was a collection of half-melted gold rings, earrings and teeth. They were digging for gold. Babi Yar was filled in after the war and the site is now part of a residential neighborhood in Kiev. There were many international protests in 2009 after the city’s mayor announced plans for a hotel on the site, but he changed his mind. 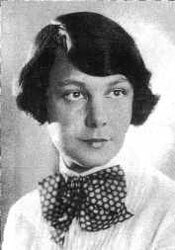 On this date in 1942, poet Olena Teliha and her husband Mykhailo were shot by the Nazis at Babi Yar for their Ukrainian nationalist activism. Olena Teliha (top) and her husband, Mykhailo Teliha. Having lived in Czechoslovakia (where they met and married) and then Poland during the interwar period, the Telihas weren’t present for the worst of Soviet depredations in Ukraine. 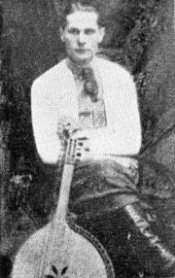 Mykhailo, a bandurist, might have been in an especially bad way, since his musical genre of choice harkened to subversive themes of Cossack insurrection, and was therefore heavily persecuted. Instead, they moved to Kiev as the German invasion opened the prospect of returning to their ancestral homeland. There they found their affiliation with the Organization of Ukrainian Nationalists quite unwelcome to the new occupiers. Olena kept writing for a prohibited nationalist paper, and Mykhailo gamely stuck by her. Not everything must be named. Can one find a motionless floor. Were able to cast aside the dark shore. Only heart — tumultuous eagle! 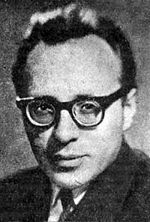 On this date in 1953, a guerrilla with the nom de guerre “Khmara” was shot in Kiev’s Lukianivka Prison for his involvement in a still-controversial resistance movement. Dmytro Bilinchuk on the forest moon of Endor. UPA regs supposedly strictly prohibited photography; being rebels by nature, they snapped enough to fill up this page. History is lived forward but understood backward. Therein lies the ambiguity of the Ukrainian Insurgent Army (UPA), a nationalist organization that operated in Galicia and environs after the Nazi invasion and persisted several years afterwards. At its height, the UPA is said to have had up to 100,000 members, famously operating out of subterranean forest bunkers. This day’s victim was the captain of one of its companies; there is very little about him available online in English — principally his death date — but Ukrainian sites add the folklorish but poignant detail of his supposed adoption of an orphaned bear cub. But about his organization, the name alone is sufficient to invite the most acrimonious debate:* were these partisans Nazi collaborators? Ukrainian patriots? Both? Ukrainian nationalists, under the leadership of a man who had abandoned socialism for a fascist national ideology (everyone was doing it), entered the World War II era having conspicuously failed to grasp independence in a period when nationhood was being handed out like candy to small European states. Brewed with the movement’s right-wing ideology, Ukrainian nationalism developed an anti-Polish, anti-Russian, anti-Communist programme, and it gazed around 1930’s Europe wondering if it couldn’t find an aggressive great power with a similar outlook that might take Ukraine under its wing. Fast forward to the eve of World War II: by the terms of the Molotov-Ribbentrop Pact, Hitler and Stalin carved up the Ukrainians’ rival and thrust Galicia into Soviet hands, incidentally exposing its inhabitants to the pleasures of life under Stalin. For Ukrainian nationalists, the altered situation of the Poland partition — followed shortly by Hitler’s initially successful invasion of Russia — offered an apparent opportunity to realize the dream of statehood under the patronage of a somewhat congenial Nazi government. Though there’s a great deal of contention this author is not remotely qualified to referee about precisely which organs collaborated with or resisted the Nazis in precisely which ways, it seems fair summation to say that Ukraine’s nationalist movement was happy to treat with Berlin. Berlin being more reserved about a Slavic nationalist movement in its conquered territory, the UPA’s proposed institutional alliance with the Wehrmacht never quite came to pass as such, but that left many nationalists as freelance collaborators instead. ** The hypothetical Ukrainian state in a Nazi-dominated Europe was not going to come about by sabotaging the Germans. 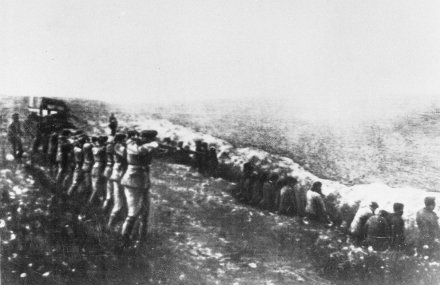 Instead, the UPA got busy laying the groundwork for an ethnically homogeneous Ukrainian homeland by fighting a reciprocal dirty war of ethnic cleansing against Poles in Galicia (most notoriously and emblematically, at Volhynia) — eventually developing into inter-partisan civil warfare against both Polish and Communist units (who had their own differences) with the odd brush with the Wehrmacht mixed in, and giving way to full concentration upon Soviet authorities as Red Army drove out the Germans. The fact of having engaged German troops is a loudly bandied point in the UPA’s modern defense — the elevator pitch is that they “fought the Nazis and the Communists,” though it sure looks like they fought the one a lot harder than the other, and fought both less eagerly than they fought the Poles. There may be no cause to call UPA fighters other than sincere patriots of a nation whose aspirations were no less worthy than any other, who under beastly circumstances and for motives they believed noble committed sins no uglier than many other nationalists: even so, the thing separating that militia and its movement from, say, the Croatian Ustashi looks like opportunity rather than principle. Most perceived at the strategic plane a clear choice between Nazi victory with Ukrainian independence and Nazi defeat without, and most consciously preferred the former. No doubt the UPA would retort that its only other option was worse. While Ukraine had a predictable exodus of anti-communist types as World War II drew to a close,† thousands of UPA guerrillas stuck around to keep up their fight (already underway) against the Soviets — including Dmytro Bilinchuk, whose biography can be enjoyed by readers of Ukrainian here. It took a decade or more for Russia to extirpate this movement by hunting down its Bilinchuks. Buried in obscurity for the remainder of the Cold War, however, the martyrs of the OUN and UPA have pried open their tombs since Ukraine separated from the USSR in 1991 and become a contentious symbol in present-day Ukraine. Proving Faulkner’s old aphorism that the past isn’t dead and isn’t even past, this latter-day party and others of the Orange coalition remain electorally rooted in the UPA’s old western Ukraine stomping grounds, and tend to lean towards western Europe in outlook; eastern Ukraine remains more heavily Russian-oriented, and more inclined to the Russians’ distasteful view of the OUN and UPA. * See, for instance, this Axis History thread, or the UPA’s Wikipedia discussion page. ** Late in the war, Germany would eventually form its own Galician SS Division. UPA proponents take pains to separate this German-officered formation from UPA guerrillas. are really having the best of both worlds. They do not qualify as Soviet citizens because their place of birth and/or habitual domicile on 1.9.39 were in Poland, and they therefore by our definition escape all punishment by the Russians for their having assisted the enemy; and they are not presumably eligible now for punishment by the Polish authorities because that part of the country from which they came is no longer part of Poland.